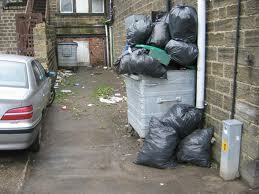 If you are looking for fast and reliable commercial waste removal in Rush Green RM7 then you’re in the right place. 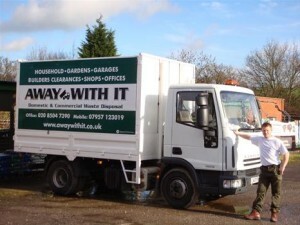 Away With It has been providing commercial waste removal Rush Green businesses trust and recommend for more than a decade. They love our fast, flexible service and low prices and we’re sure you will too. We have extensive experience in all types of business waste removal and provide a quick, efficient collection service that makes a big hole in your commercial waste without busting your budget. We are proud to provide the best services around with custom made packages to suit the exact requirements of every business. We provide attractive incentives and discounts for contracted clients although we are just as happy to provide our services on an ad hoc basis. From single items on a one off basis or regular, full or partial loads we can move them all quickly, efficiently and for a competitive price. We are fully licensed and insured to remove commercial waste products from the Rush Green RM7 area. Our uniformed workers are the ultimate professionals – always smart, tidy, on time and they do a great job. They will not leave your business premises until the place has been swept clean and tidy to your, and their satisfaction. We provide a same day collection and removal service if needed for those emergency situations. If you have some commercial waste which you need to have shifted in a hurry from Rush Green RM7 give us a call and we’ll get right on it. We work 7am to 11.30pm seven days a week to provide the ultimate service – early mornings, late nights and weekends are no problem for us. When we tell you the price that’s the end of it . We don’t believe in adding on surcharges or hidden extras. 80% of the business waste we transport will be reused or recycled. Our experienced team are here to answer your questions 7 days a week and will be more than happy to put together a package to meet your business needs and budget. Or to get a free competitive quote send us your details using our online enquiry form and we’ll get back to you the same day.